The funds are not mutual funds or any other type of Investment Company within the meaning of the Investment Company Act of 1940 and are not subject to its regulation. DB Commodity Services LLC, a wholly owned subsidiary of Deutsche Bank AG, is the managing owner of the funds. Certain marketing services may be provided to the funds by Invesco Distributors, Inc. or its affiliate, Invesco PowerShares Capital Management LLC (together, “Invesco”). Invesco will be compensated by Deutsche Bank or its affiliates. ALPS Distributors, Inc. is the distributor of the funds. Invesco, Deutsche Bank or ALPS Distributors Inc are not affiliated. Commodity futures contracts generally are volatile and are not suitable for all investors. An investor may lose all or substantially all of an investment in the funds. The DB G10 Currency Harvest Fund (DBV) was the first to be incepted in 2006 among these three funds. The other two funds, UUP and UDN were introduced later in February 2007. The funds have 0.75% annual expense ratio. 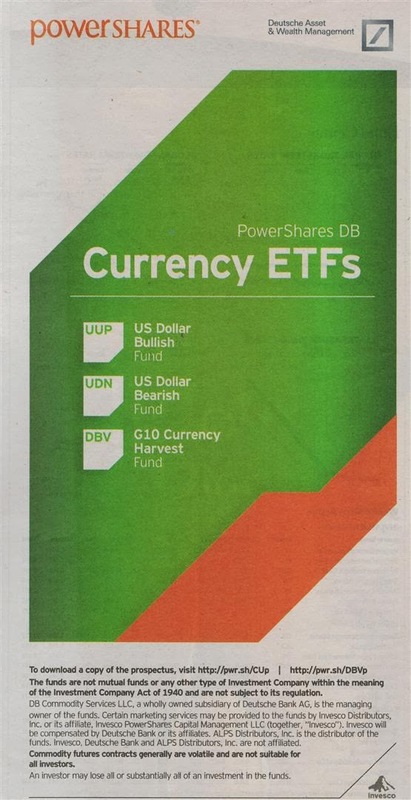 The PowerShares DB US Dollar Index Bullish fund seeks to track the price and yield performance, before fees and expenses, of the Deutsche Bank Long US Dollar Futures Index. It has total net assets of $690.79 million. The fund is traded at $21.72. In 2012, this currency fund has YTD return of -2.94%. It has returned -2.36% over the past 3 year, and -2.91% over the past 5 year. In 2014, the YTD return is 0.70% (up to 1/12/2014). PowerShares DB US Dollar Index Bearish fund tracks the Deutsche Bank Short US Dollar Index. The fund’s CUSIP is 73936D206. Its total net assets are $64.52 million. The 52 week price range is $25.49-$27.50. The total assets are $65 million. The 1-year annualized return is 0.22% and 5-year annualized return is 2.11%. The benchmarks are U.S. Treasury Bills Index and S&P 500 Index. The top component of USDX Futures Contract is Euro (57.6%). The Powershares DB G10 Currency Harvest Fund is currently traded at discount -0.16% from its NAV. Its total net assets are $224.78 million. It uses S&P 500 Index and U.S. Treasury Bills Index as its benchmarks. It invests by tracking the level of the Deutsche Bank G10 Currency Future Harvest Index. The G10 currency include U.S. dollars, euros, Japanese yen, Canadian dollars, Swiss francs, British pounds, Australian dollars, New Zealand dollars, Norwegian krone and Swedish krona. Investing in currency ETF provides great opportunity and risk. These funds may be suitable for short term trading vehicle. The funds’ performances haven’t been great as well. Please thread carefully when investing for long term. These funds have low expense ratio fee.